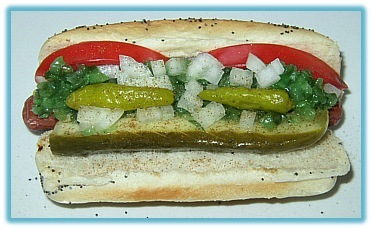 Chicago is known for it’s hot dogs with mustard, relish, onion, sport peppers, pickles, and celery salt (never ketchup) Dallas dogs include only chili and shredded cheddar cheese. And Philly builds them the way you like it. Even the hot dog, as we know it, is the result of the “inside the box’ thinking-spurring question being asked at the right time. But we owe all of our ‘dog days’ to Antoine Feutchwanger who sold sausages at the Louisiana Exposition in 1904. He first sold them on plates, but this proved too expensive. He then offered white cotton gloves along with the franks to prevent customers from burning their fingers. The gloves also were expensive, and customers walked off with them. Antoine and his brother-in-law, a baker, sat down and brainstormed. “What could be added to the frankfurter that would be inexpensive and would prevent people from burning their fingers?”His brother-in-law said: “What if I baked a long bun and slit it to hold the frank? Then you can sell the franks, and I can sell you the buns. For years I have talked about going inside the box-in this case inside the package- using 3D Thinking. There are some fundamental 3D principles that we should apply to all problem solving. Here is a review. Differentiate. Every problem is unique. Don’t copy a solution from elsewhere. Drive: Continually ask the purpose of the solving the problem. Don’t be bashful. Many problems are simply derived from asking the wrong questions. Question everything. Ensure you have identified the problem correctly before you start working on the solution. Define: Define the end results FIRST and then work backwards. Find solutions that achieve the focus of the purpose. Digest: Every solution is normally part of a larger system. We buy 8 hot dogs but we are forced to buy 10 buns. What do we do with the extra buns? Now I know that some of us, I guess, are capable of daring leaps of imagination. Play the game. Innovate at the speed of change. Is it time to quit or simply start over? Ask, What If? What if yogurt came with a spoon? What if we put the Dyson ball on a skate board? What if movie theaters charged for ‘where you sat’ like live theaters? What if movie theaters offered an all day pass that included all you can eat, drink, and watch? What if there are other products that could be put in pouches like tuna? Only creativity and aggressive innovation-in the face of hardship and layoffs and seriously tough choices-will fuel a turnaround if we prune the unproductive and broken, and nurture those enterprises that point to a more positive future. It is time to move our thoughts to more inventiveness to discover lessons that remind us that size no longer equals safety and age is not always the best teacher. A recent survey of top executives from Fortune 500 companies through out the United States ranked creativity more important than Intelligence for success in business today. That’s because these demanding times require leaders who can respond quickly and imaginatively to change. In these do-more-with-less downsized times, the need for everyone to contribute creative ideas and original solutions has never been greater. And the lead must come from the top. Today commit to using your imagination and your reasoning ability to help discover how to liberate your mind from the constraints of habitual thinking.Create, in your mind, a solution centered mindset for the realization of your most ambitious innovation objectives and the fulfillment of your highest personal aspirations. Starting now…proclaim your creative thinking. Remember Innovation is how we make money from Creativity. See a need. Fill A Need. It’s that simple. In the meantime…. charge for your WISDOM. Ask What IF? What’s Next? What’s Possible? Why Not?